Digital UltraViolet and Digital Copy will makes it possible for you to stream the movie Game Night HD UV or iTunes instantly to your computer and compatible Smartphones, Andriod, iphone, iPod Touch, iPad and tablets devices anytime, anywhere. 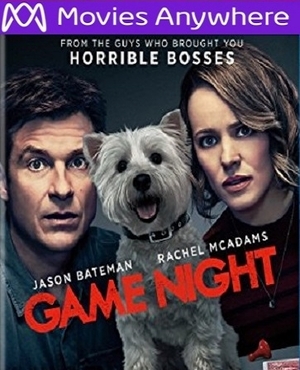 You can also download a Digital UltraViolet Copy or a Digital Copy of the movie Game Night HD UV or iTunes to your computer and compatible devices. Bateman & McAdams star as Max & Annie, whose weekly couples game night gets kicked up a notch when Max's brother (Chandler) plans a murder mystery party that turns out to be real.